Your child is making significant progress and is showing signs that he may be ready to transition to the toddler bed. Another child could also be on the way, and you need to evict little Timmy for his little sister or brother. However the case, you will need the best toddler bed in the market for the evictee. When it is time for your child to switch from a crib to a larger bed, most parents will worry about their child falling out of the bed and hurting themselves. While using a rail is a great way to prevent injury, there are a few things that you need to keep in mind before using one of these types of products. If you are planning on co-sleeping, it is important that you don’t use a rail that could possibly trap your baby between the rail and mattress. Look for a top-of the mattress or certain bumper styles that state they are safe for co-sleeping. If you are looking for a rail to prevent your child from falling out of bed, it is important that you get a rail that will fit the bed properly and is properly secured. To ensure that you get a secure fit, measure your mattresses height and length and then check the specs of any product you are considering purchasing. Children and infants have died from becoming trapped in the gap between rails and mattresses. While safety standards have dramatically improved in the last ten years, if not used correctly there is still some chance of injury. It is very important that you spend a bit of time researching what will fit your bed properly in order to keep your kids safe. There are a number of factors that make one bed better than the other. When it comes to choosing the best toddler bed, you need to be keen not to pick something the kid will not like. If possible, take them with you so that they may have a hand in the selection process. There are a number of different types of bed safety rails for kids with slightly different features. 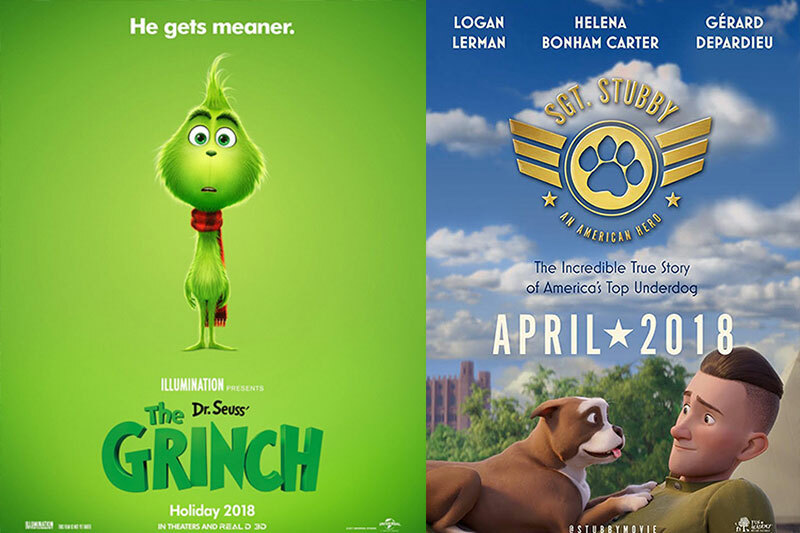 Here is a list of some of the top sellers that have the best reviews and ratings. 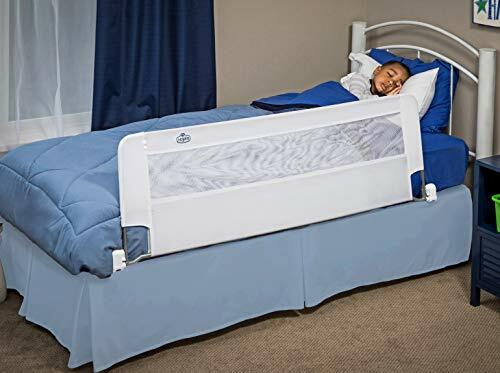 This portable foam bed rails/bumper includes a cover with an anti-slip bottom extending up the side to help prevent it from slipping or falling off the bed while keeping your young children in bed through sleeping transitions. It can be used for elderly family members and pets as well. It comes with the cover that can be easily removed and washed to keep the foam bumper fresh and clean, after those little accidents while being BPA, phthalate, latex, and odor free. 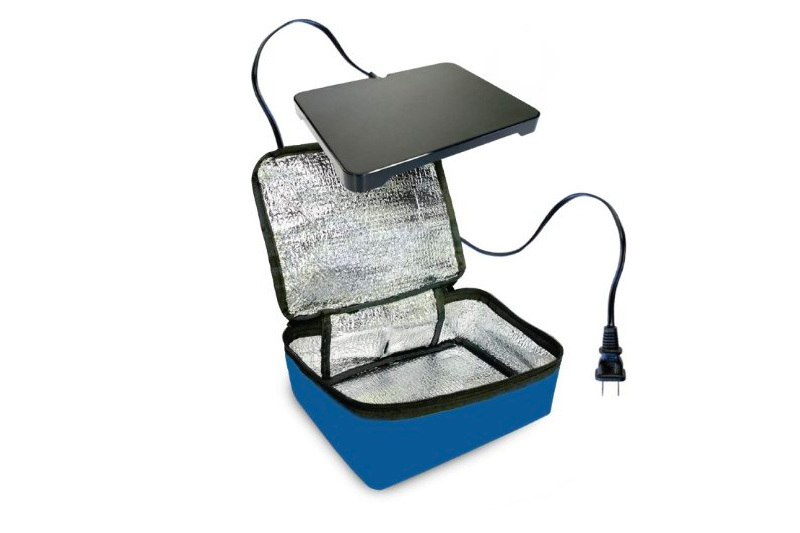 The included compression style bag makes it easy to store bumpers for convenient transport to your destinations. 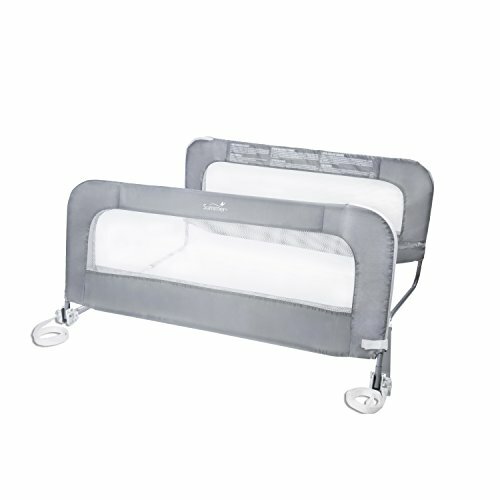 The rail is designed to be safe and versatile, firm enough to gently keep most sleepers in bed while soft soft enough to allow parents and individuals with potty-training needs, or physical limitations, to more easily maneuver in and out of beds, bigger than a toddler bed, at home or while away. Anti-slip material on the side helps to keep the bumper from falling off the side of the bed. The anti-slip material on the bottom keeps the bumper from moving around on the bed. Your child’s bedding won’t be pinned down with our bumper. Bedding will neatly lie over the bumper and on the bed, easily pulled up and down. Changing the bedding can be done safely, as usual. No dancing over a rail on the floor. The water-resistant, anti-slip cover can easily be cleaned too- just remove, wash in a gentle cycle and air dry. The Big Sky Traders (Single) foam safety guard rail bumper can be taken anywhere. With the compression style travel bag, this bumper travels easy. Regalo HideAway Bed Rail is specifically designed to protect children or toddlers by not letting them fall out of bed due to rapid movement. Manufactured out of steel, the Regalo bed rail bar has three length options to choose from; keeping your child where they’re supposed to be while sleeping. With an all-steel construction, the Regalo HideAway Double Sided Bed Rail is ready to handle the everyday use of a little one. Perfect for the restless sleeper or for a bed that is not against a wall, the bed rail fits up to a queen mattress and measures 43” long and 18” high. The added security, provides peace of mind that your child will remain in bed throughout the night. The Regalo HideAway Double Sided Bed Rail requires no tools and assembles quickly. The convenient spring locking knobs on the Regalo HideAway Double Sided Bed Rail allow you to easily change the position of the rail. To lock in place, just push the locking knobs down and the gate will lock into position. When it’s time for your little one to get out of bed, just push up on the locking knobs to release the rail will fold down. When parallel to the bed, slide it along the Glide Trac System to store the rail discretely between the mattress and box spring. Not only can your rail hide under the bed, but it also our patented Gap Guard protection which helps prevent gaps from forming between the rail and mattress. And if the durable mesh nylon fabric that encloses the steel frame gets dirty, simply wipe it with a damp washcloth or throw in the washing machine for easy cleaning. Next up is the extra-long Regalo Bedrail measuring in at 54-inches. That’s right, it’s an incredible 54-inches of toddler night-time protection. Some children are renowned for rolling side to side in their sleep. Somehow, they also roll up and down the bed, being the restless sleepers that they are. In some cases, they even managed to wriggle around the existing bed rail. That’s when Regalo rail comes in. Regalo has put a ton of effort into ensuring their rail is as easy to use as possible. You can simply pop the rail underneath your child’s mattress, and that’s it. The swing down design means you only have to swing the rail down on its hinge to move it out of the way. This allows your toddler to easily jump out of bed, ready to start their day. The bed rail measures 20” high to accommodate thick mattresses and extends an impressive 54” to provide the utmost coverage of the bed. For added convenience, the rail swings down and out of your way, making it easy to access the bed. With added protection, the Regalo Extra Long Swing Down Bed Rail provides a safe sleep as your little one transitions to sleeping in a bed. When your child is getting used to sleeping in their new “big kid” bed, they might rely too much on the safety that their crib once provided. This is especially true if your child is an active sleeper who likes to roll around and change positions a lot in their sleep. 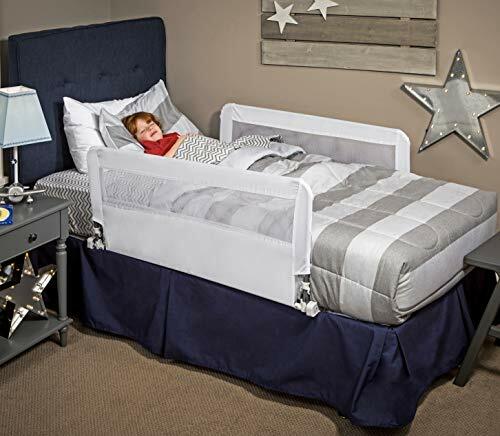 It is hard for children to tell that they are near the edge of the bed when they first start sleeping on a real mattress, but the Foam Toddler Safety Side Rail for Bed helps to trigger a natural response in them that will keep them from falling off. 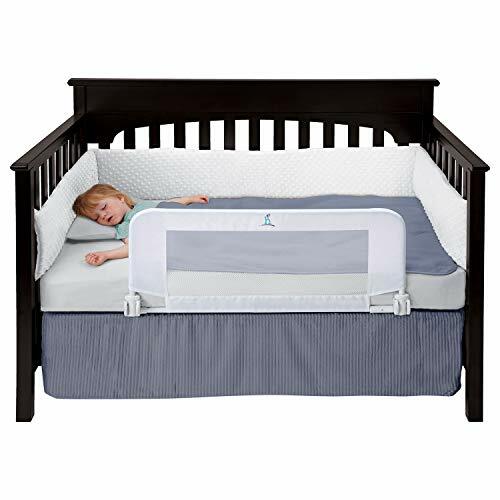 The Foam Toddler Safety Side Rail for Bed is a foam bed rail bumper that is ideal for toddlers, kids and those just getting used to sleeping on a mattress. 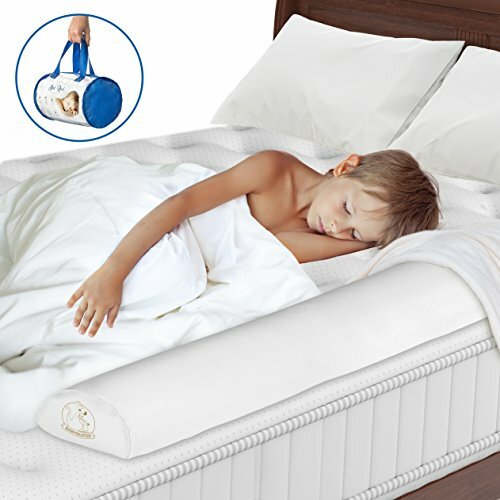 The foam is made from non toxic materials and sits at the perfect height to keep children from falling off the bed without making them uncomfortable. 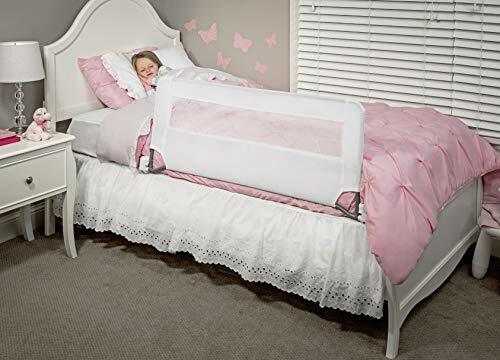 This bed rail bumper works by triggering the passive safety response in children, making them move away from the impending danger even in their sleep. There is plenty of room between the bumpers to allow them to stay comfortable and switch their positions as they are so prone to do. These mattress pad style bed rails can fit onto any bed that has deep sheets and will work with any bed covers due to their white hue. The Foam Toddler Safety Side Rail for Bed installs in mere seconds so that your little one can lay down for their nap or to sleep for the night right away. The sheet comes off easily and is simple to wash. There are many things to like about the ComfyBumpy Toddler Bed Rail. For one, it is universal. It can be used for all types and sizes of bed—kid twin beds, convertible crib, queen-, twin-, and king- sized beds. 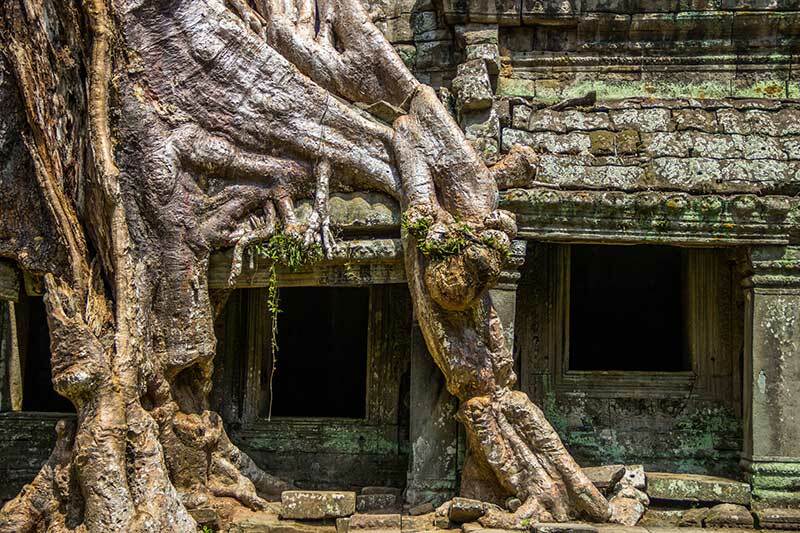 Second, it is considered to be triple-safe because it can be secured tightly in three different ways—wood bases with the use of screws, slats, and springs with the use of Velcro and boxsprings with the use of straps found under the mattress. Above all, it features an innovative design with flat iron bars that secure your child without them feeling the bars located under the mattress. In addition to that, it has a curved pull-down design allowing it to easily fit inside the bed frame. It is also easy to install since you only have to pull on the latch to quickly pull down the bed rail. It is taller than other rails, but it compiles the new safety regulations. It uses quality materials, and it’s secured to the crib’s frame, not the mattress. It doesn’t have exposed sharp edges that could harm the kid, and it folds down allowing for easy changing. Its design is made to allow it to fold down completely for convertible cribs. Seeing that it is put on the frame, it is simple to install and requires no tools. It secures the frame tightly with slats and springs using Velcro. All you need to do is pull on the latch to remove the bed rail quickly. The flat iron bars hold up until your baby outgrows it. It is made for all bed sizes; twins, doubles, queens, and kings. The breathable mesh padding is durable, so you don’t have to worry about it tearing or fraying. With an all-steel construction, the Regalo HideAway Extra Long Bed Rail is ready to handle the everyday use of a little one. To accommodate beds up to a queen sized mattress, the rail measures 54” long and 20” high. The extra length of the bed rail helps guard from accidents. The Regalo HideAway Extra Long Bed Rail requires no tools and assembles quickly. The Regalo HideAway Extra Long Bed Rail allow you to easily change the position of the rail. The spring locking knobs easily lock in place, by pushing the down on the knobs and allow the bed rail to lock into position. When it’s time for your little one to get out of bed, just push up on the spring locking knobs to release and the rail will fold down. When parallel to the bed, slide it along the Glide Trac System to store the rail discretely between the mattress and box spring. The bed rail features our patented Gap Guard protection which helps prevent gaps from forming between the rail and mattress. The bed rail is equipped with a durable mesh nylon fabric that encloses the steel frame and makes it comfortable to the touch. If the nylon gets dirty, simply wipe it down with a damp washcloth or throw it in the washing machine. This is a very affordable edition to have at home. 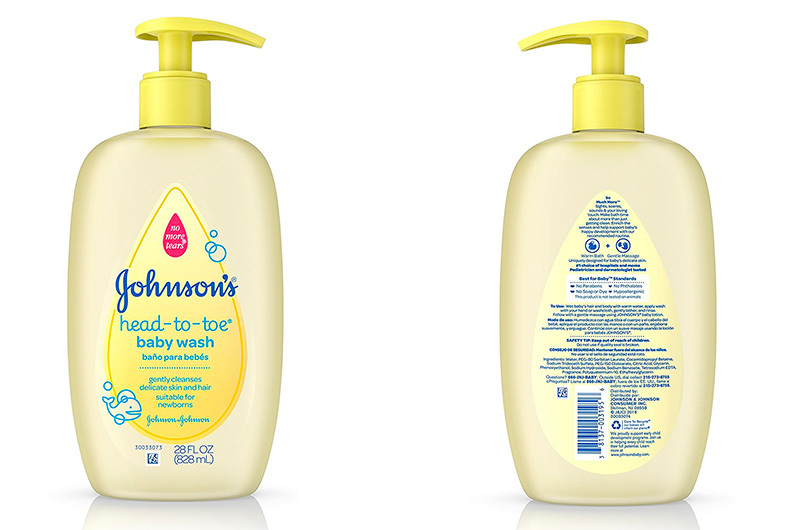 It is safe for your little one without being overly restrictive. It’s soft cushy material lets your child bump into them without getting injured; is easy to wash and keep clean. Although, some parents had trouble getting the bottom to grip the surface of the bed, and kids can climb over. 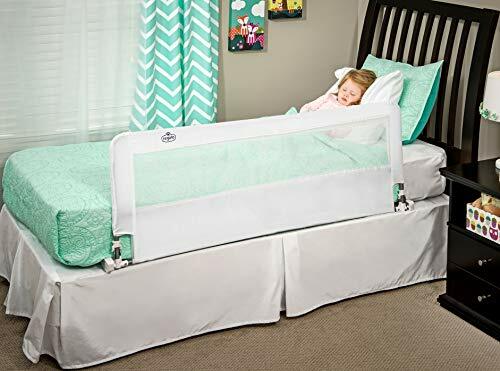 This bed rail guard is designed around parents’ peace of mind and the safety of their little one. Transitioning from baby to toddler is exciting and nerve-wracking. The reinforced anchor attaches directly to the crib to ensure the railing will never shift. Parents no longer have to complicate themselves. No tools required and image-rich instructions included. No sweet time is being prevented, so this bed rails is designed with a two-hand release which quickly lowers for access. There is nothing worse than thinking you got a great deal, only to find out you got tricked? 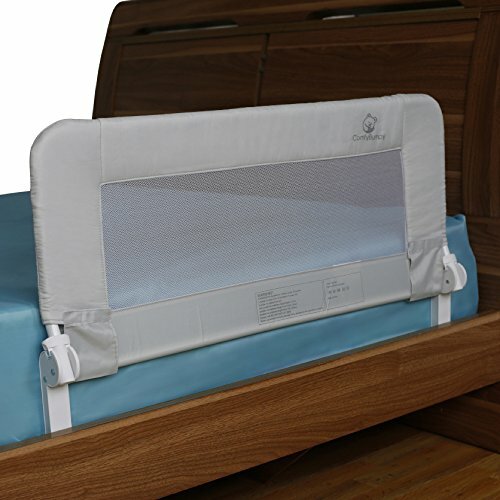 That’s why this hiccapop convertible toddler bed guard rail uses only the highest quality metal, nylon-plastic and heavy duty fabrics available, so you can use it for your boys and girls for a lifetime. Crib mattresses come in a variety of thicknesses, so rather than building a crib railing that only fits thinner ones, they designed this rail to adapt to even the thickest beds. Summer Infant Bed Rails work perfectly on both solid and slatted bed bases. They are manufactured from toughened fabric and use a locking-anchor mechanism to secure the bed rail in position. The length of the locking-anchor mechanism can be adjusted between 70 and 90 cm to enable it to fit onto a variety of different sized beds. It comes with a 3-stage folding mechanism to allow your child to get in and out of bed easily. This features also helps you to changed the bed linen without having to first remove the bed rail. 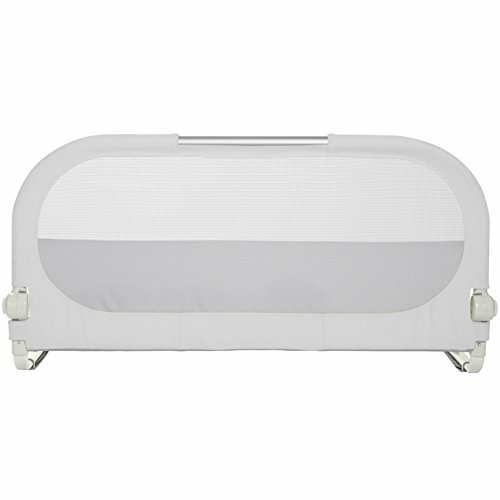 When not in use, the Summer Infant Bed Rails can be folded away and stored. They are also very convenient if you need to travel on holiday. The Summer Infant Bed Rails come with anchors to provide added stability. You simply extend the “arms” to the required length and hook the anchors around the other end of the mattress. Once installed, the bed rail folds down to enable your child to get in and out of bed or to make it easier for you to change the bed linen without removing the bed rail. You will, however, need to use both hands to achieve this. Whilst it is possible for a single person to install these bed rails, it is much easier if there are 2 of you. The innovative fold down Sleep Bed Rail by Munchkin features a durable aluminum frame. 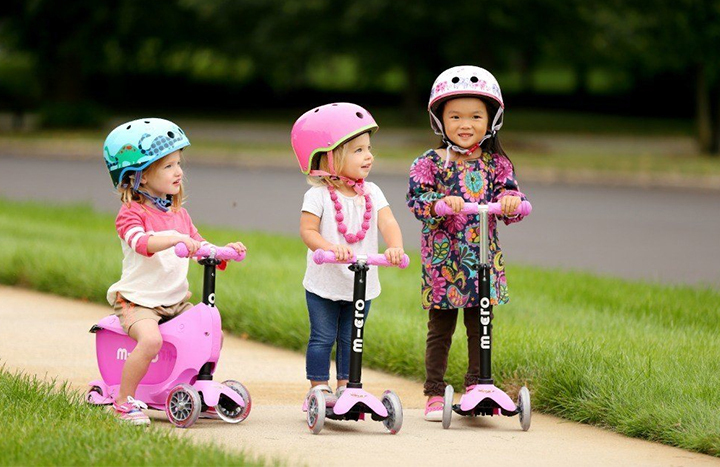 A modern design and is available in many fun colors to compliment your décor is combined with the ultimate in safety. The assembly for this one is really simple. All manufacturers claim that assembly and installation are pain-free and fast, but this rail by Munchkin is so easy that you can put it together in just a couple of minutes. You can see that Munchkin has also nailed it with the fold down site. The push button hinge is user-friendly, and the ease of the hinge operation will not be frustrating for busy parents. Another ease of use feature is the cover. The mesh fabric cover goes on and off in a flash, and it’s totally machine washable and wipes clean in between washings. You might find it shorter in length than you expect since it measures 29 inches in length. The Munchkin is also not suitable for use on cribs or convertible cribs. 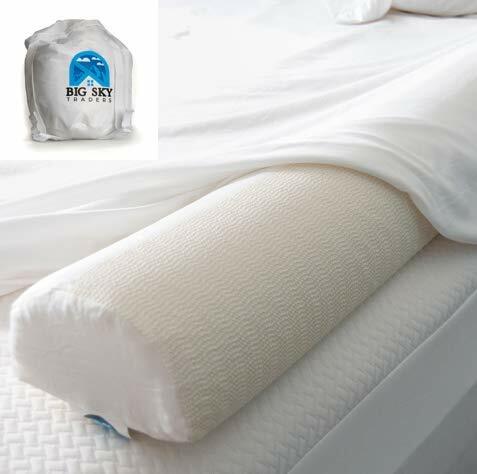 It is strictly designed for use with twin, full and queen-sized mattresses. Another good option from Regalo is the regular Swing Down rail. This sturdy, swing down model can help you and your child get a better night’s sleep, and it works perfectly for twin, full, and queen size mattresses. With a nice, longer length of 43 inches, This Regalo adds security and peace of mind. It’s also a good option for older children and adults, and there’s still enough room at either end for easy access. The Swing Down is completely PVC and lead-free, and is certified by the Juvenile Products Manufacturers Association and backed up by a limited 90-day warranty. The rail cover is made with a breathable mesh fabric which makes it a plus, so it’s safe if the child snuggles up against it. It’s also machine wash and line dry, and easily wipes clean with a damp washcloth between washings. However, this model might give parents a few difficulties in assembling although no tools are required. It might take two people to assemble, install or adjust it. Another thing to keep in mind is that the hooks are a bit unstable, so the rail may move from side to side with mattress movement, making the rail less secure. There are numerous kinds of toddler bed rails out there that will work perfectly for your kid. Whichever you choose to go with, remember that the best bed rails for kids are ones that scream safety first. These are inexpensive must-haves for your toddler between ages 2 and 5. Some toddlers remain perfectly still at night. And if so, then safety bed rails are just-in-case. But if she’s the “active while asleep” type or has simply fallen out of bed before, chances are it will happen again. Toddler bed rails are perfect to stop situations like this from happening.